Tomato-Anchovy Crisps - A recipe from Savor California, the online showcase for extraordinary gourmet foods and beverages from California. In a bowl, toss together the chopped tomatoes, balsamic vinegar, and chopped herbs. 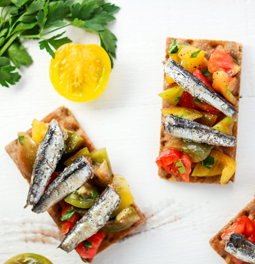 Top each crisp or cracker with the tomato mixture and 2-3 Wild Planet White Anchovies. Finish with a bit of freshly ground black pepper and serve.